Enjoy a restful holiday in Mauritius when you reserve the Villa Balaclava, close to the vibrant tourist hub of Grand Baie. 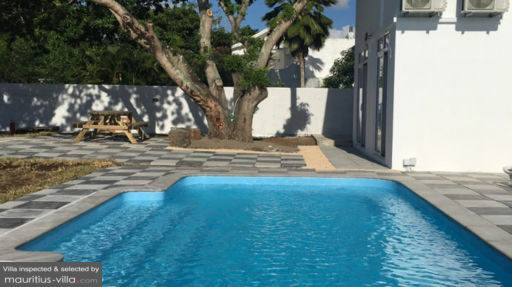 With multi-stories, this particular villa is ideal for larger families as well as groups of colleagues and friends looking for accommodation in Mauritius. Thanks to its proximity to the beach, this particular villa is ideal for travelers who wish to enjoy a fun holiday frolicking in the sea as they soak up the warm tropical sun. Best of all, there’s plenty of space for everyone to relax and enjoy their vacation. As a guest of Villa Balaclava, you can choose from three different bedrooms, all of which feature double beds and air-conditioning units which will certainly come in handy if you’re visiting Mauritius in the summer. The master suite comes with its own private bathroom where you can unwind and relax with a soothing shower in all privacy. The sprawling yard offers a delightful swimming pool where you can float on your back and gaze up at the clouds as you work on your tan. Alternatively, you can keep up with your daily workouts as you swim laps in the crystalline waters, or spread a towel by the water’s edge and relax under the gloriously warm sun. Outside, there’s also a cozy sitting area where you can enjoy lunch or dinner as you make the most out of the tropical atmosphere. Rest assured that the lawn does offer a huge tree which provides plenty of shade for when you want a respite from the sun. Warm, cozy and comforting, the living areas of Villa Balaclava radiate a distinct sense of homeliness. At the end of a fun-filled day, kick back and relax on the rattan sofas as you catch up and share stories about your holiday in Mauritius. This space also has a coffee table, perfect for when you want to enjoy cocktails or any refreshments in the intimacy of your suite. With an open-plan layout, the living room gives into a spacious dining area. If you don’t want to eat out or if you want the convenience of customizing your own meals, rest assured that the villa does come with its own perfectly-appointed kitchen where you can assemble an easy, home-cooked meal. Along with the sitting space next to the dining area, there’s also a separate living room, complete with a flat-screen television so you can keep up with your usual shows. As a guest of Villa Balaclava, you can enjoy a variety of complimentary services that will ensure an excellent vacation. For example, you don’t have to worry about cleaning up after yourself since a housekeeper will show up every day, ensuring that you can always have a neat and clean environment to live in. By the same token, a gardener will stop by regularly to tend to the grounds. With free Wi-Fi, the villa also offers different paid services such as airport transfer, daily breakfast and more. Villa Balaclava places you close to Grand Baie, a vibrant hub brimming with an assortment of shopping malls, restaurants and souvenirs. Stroll down the popular Sunset Boulevard which lies next to the beach as you browse through colorful craft stands for souvenirs to bring back home.